You’ve probably heard of “sciatica.” What exactly does this oft-used but medically nonspecific word mean? What are some common causes, and ways to limit or prevent the condition? Here are some tips, courtesy of the Virginia Chiropractic Association. The sciatic nerve (see insert) forms where the lower back (lumbar) nerves come together, forming a very large nerve trunk. It travels down the back of the thigh and leg, controlling movement and sensation in these areas. In the gluteal area, it passes over, under, or through a muscle called the piriformis. When the piriformis (Latin for “pear-shaped,” as the muscle is roughly shaped like a pear) is chronically irritated, it can mechanically irritate the nearby nerve trunk, or chemically irritate via a substance called “substance P” (P for “pain”). Pain in the gluteal region can also come from the joints of the low back, or the large joints where the base of the spine and pelvis meet (the sacroiliac joints). The nerves that feed a joint also tend to feed its related muscles and connective tissues (Hilton’s Law), and thus irritation of one area can “refer” pain to associated areas. This is different from nerve root pain, which is more common in such situations as a bulging or “herniated” disc. The shock-absorbing discs between the spinal bones can bulge and fail, thus irritating the low back nerves that send signals down the back of the thigh and calf. The key to treating any condition– whether in a car, or the human body– is identifying the source of the problem and correcting it. In the case of “sciatica,” the doctor’s job is to differentiate between the sources of pain listed above, and to apply the appropriate treatment. 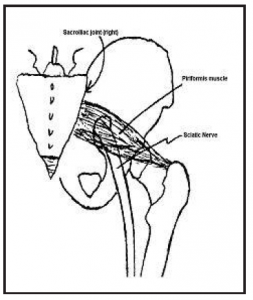 A pulled hamstring is very different from a piriformis syndrome or disc bulge causing hamstring pain. Doctors of chiropractic are highly trained in anatomy, including the neurology of disc, low back, and muscle/joint problems. While physical therapy modalities (ice, ultrasound, interferential electrotherapy) may have a role in treating sciatica and back pain, they are typically only a component of the treatment rather than the entire plan. Acupuncture has shown promise in a variety of pain syndromes, including sciatica i. Ergonomic changes are also recommended in some sciatica cases. For example, chronically sitting on a wallet in the back pocket may irritate the sciatic nerve, the piriformis muscle, or unbalance the pelvis (the “hips,” loosely speaking) and related structures. Simple self-care measures such as moving your wallet to the front pocket are first-line treatments for some patients. Though some doctors will treat a piriformis or related syndrome with anti-inflammatory agents, and though other doctors will actually inject botulism extracts directly into the piriformis muscle ii, chiropractic management for “sciatica” is ideal. After narrowing down a differential diagnosis, and after ruling out self-sabotaging behaviors that are ergonomically incorrect, the doctor of chiropractic will focus his or her treatment on the affected tissues. If the disc is involved, specialized chiropractic techniques exist that directly address the pathologies. Some chiropractors will also focus on the nutritional components of inflammation; and since the intervertebral disc is up to 90% water, hydration may also be a topic your chiropractor may choose to address with you. Finally — and in many cases, most importantly — doctors of chiropractic will address the joints, muscles, and nervous system patterns that tend to prolong pain-generating patterns. Manual manipulation of spinal joints, soft tissues, and related areas can have a very powerful effect on an otherwise chronic, debilitating condition. Balancing out the function of the hips, spine, and related structures can have a profound affect on your pain levels, your level of function, and your return to a more normal life.